In the free virtual library of UNINETTUNO University the student can access all the educational materials posted into the Cyberspace. Entering the online Virtual Library, the student accesses an Intelligent Bibliographic System (IBS). Simple consultation: the system gives the students “pre-structured” bibliographical references related to the issue being treated. It is a static and automatic bibliographical reference. Intelligent query: it allows for a dynamic bibliographical reference aimed at the individual students’ queries. The IBS allows for a constant updating and its database can be continuously enriched by adding new educational materials. Teachers and experts, from anywhere in the world, can post their results of their research works and expand the database. In these virtual spaces, the student can rely on a very huge repository of educational materials in several languages that he can otherwise hardly find in actual libraries. 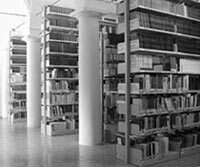 Therefore, it is not only an Italian Virtual Library, but an international, multimedia and interactive library. Any student accessing our free Virtual Library can start – by himself or being assisted by his teacher-tutor – a journey to deepening the issues he is interested in, widen his cultural background and travel in all the directions offered by a virtual library. Texts, videos and pictures, linked to one another through hypertexts that the student can search by issue, author, key words or sentences; he can also implement customized links, browse the identified texts, display pictures, expand levels, copy, save and print the section he is interested in, beside choosing the language in which he prefers searching for educational materials. Each box of the search form below, corresponds to a kind of information that the student can search in “his own” Virtual Library.